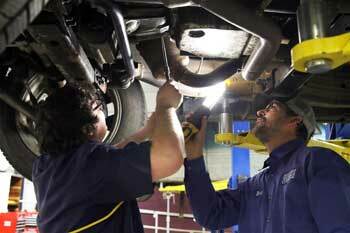 Bret Pope, right, FHTC automotive instructor, assists a student with a repair during a class. Courtesy photo. Flint Hills Technical College has a new program and extension campus available for the upcoming fall 2019 semester. The new hospitality dietary management program will be available at the college’s main campus. The program offers a technical certificate option, and will be a combination of culinary basics and management paired with courses in healthcare including nutrition, growth and development, and gerontology. Also new for 2019, FHTC will have an extension campus in Garnett, Kan., for automotive technology. Students taking the program at Garnett will have a technical certificate option with transferability to complete an associate of applied science degree on the Emporia campus. Bret Pope, current FHTC instructor with 20 years of educating experience, will be the instructor for the Garnett campus. For more information about Flint Hills Technical College, see fhtc.edu.